The enhanced fully multi-coated CEMAX(tm) 2X Barlow Lens. 1.25" Barrel Size. Specifically designed for use at H-alpha (or Ha) wavelengths, this Barlow uses optimized coatings to enhance contrast, minimize glare and also affords excellent contrast. Meade Series 4000 #126 2x Short-Focus Barlow Lens #07273 is a compact ""shorty"" type 1.25"" Barlow. 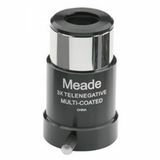 Doubles the magnification of your 1.25"" eyepiece while offering excellent image quality. Meade Series 4000 #128 3x Short-Focus Barlow Lens (1.25"") #07278. This compact ""shorty"" type Barlow triples the magnification of your 1.25"" eyepiece while offering excellent image quality. 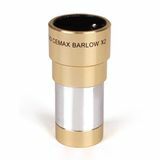 Designed to boost the magnifying power of any telescope eyepiece by a factor of 2 (or sometimes more), the barlow lens is one of the most often used accessories. It's cost effective, too. 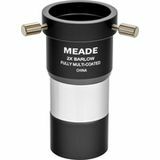 A barlow lens can save you money on eyepieces because it essentially doubles the number of focal lengths in your telescope eyepiece collection.